We at Gunner Gaming Studio are a small and relatively new independent game studio that works in the free/open source community. We already have a game on here (Block Infiltration Operations) but are looking for more exposure with our next game we just started. 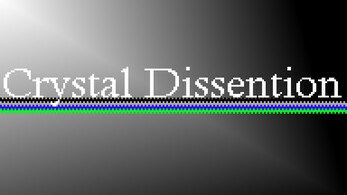 Crystal Dissention is a 2D pixel art style action/platform game where you play as a wolf heroine with magic powers who fights off other animals in the world with different magic powers. The game is being developed with unity and will be available for PC downloads handling keyboard, Xbox One controller, and PS4 controller inputs. We aren't sure when the game will be released but are happy with the last couple months of progress we have made so far. We hope you will take the time to check out the game development page. Intro text scene update (1-19-2018): Below is a new video that shows the intro text that plays at beginning of the game, it quickly details some of the lore, who's good and bad, and some stuff behind your mysterious powers. First update (4-24-17): Emerald Powers, the power of nature and the wild. Each set has an acitve(attack), passive (power/ability), and special(something powerful that has a tactical advantage). See the new emerald powers below. Second/Third Update: We release videos displaying powers for sapphire and diamond but forgot to put them here. Below are the videos in order. Sapphire is represented by blue, and can use the elements and weather to it's advantage. Sapphire has an active which is a wind gust that pushes back and deals damage, a passive that speeds up movement and jumping, and a special that rains lightning down on all foes on screen. Diamond is represented by a silver, and is the power of synthetic materials (think man made, but there are no humans). It's active is a burst of crystals in all directions, a passive that blinds foes in direction you're facing, and a special that restores health (power of light as well). UPDATE 4 (06-01-2017): We released a short video showing the onyx power animations. We haven't had much time to work on game lately do to life being busy. We will have some more progress on player controller soon. Summer Update: The two images below show what we've been working on in the past months. The first image shows a great deal of new items. On the character sprite you'll see the four colors decorating the main character. As you progress through the game you will learn the four colors and as you adapt your character will change to reflect that. In the top left you'll see the new health and power GUI. There is a classic looking heart showing off health, and a simple pixel diamond for each color showing how much power you have left of each. You will need to pick up health and powers off of defeated foes to restore yours, the pickups will be the symbols on the GUI. Also on the GUI you can see the help bar above. When not doing anything this will just show the character it belongs to which in this case is our main heroine Aurora. When performing a task you will see it updates the help bar with what is happening on screen. In this case it is alerting you that you are using the Wind Gust power. This help bar is there to clarify events in the game as well as provide a visual notification to players who require more accessibility. The second image shows the new powers menu. 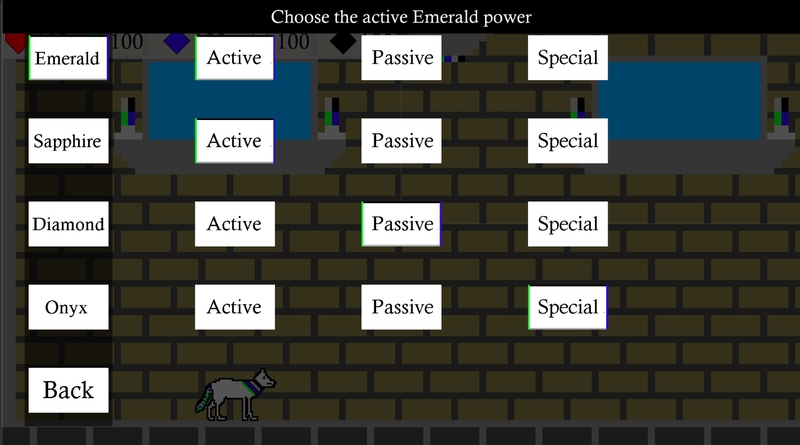 This menu is what you will use to choose which power is selected for each of the four colors. It is seperate from the pause menu, and items will only appear after you have unlocked or learned them in the game. We hope you enjoy these new screenshots of game content and look to have more info available by the end of the summer, with small updates along the way. Thanks for the support!! Fall Update 2017: Below is a new YouTube video that displays what we've been working on since the summer. 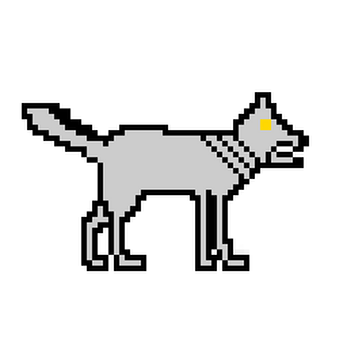 In the video you can see the biggest addition to the game progress in the foe (enemy) AI. We are still tweaking the settings on how active it is in moving/attacking but it is complete in that it has everything that a common (no powers) foe would have. 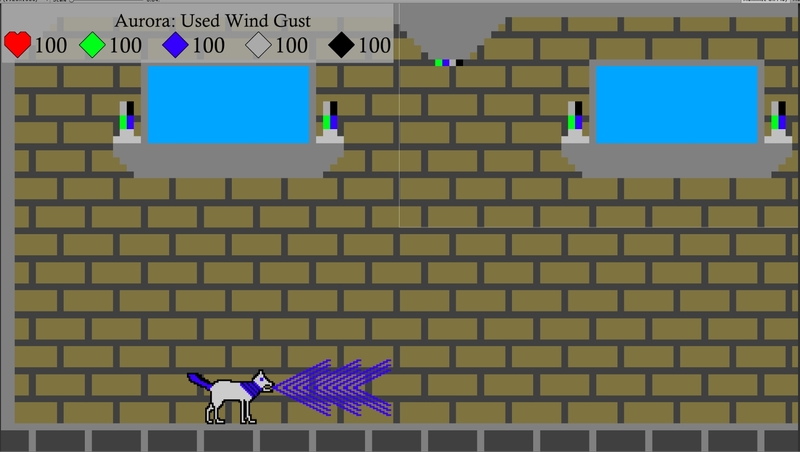 The video displays the foe moving, jumping, and attacking. There may be some moves not shown as it's decision on what to do at a certain point in time is randomized. This is just a blueprint and may change or greatly expand in the future. Along with the foe AI you can also see dealing/receiving damage and how the health bar lights up red to show damage taken. If you pay close enough attention when the foe is defeated you will briefly see a heart drop that then flashes the player health green to show an increase when it is picked up. You will notice the hover text over the foe showing it's health that also flashes red when you deal damage to the foe. You can also see that the power levels also flash when you use them, showing them being exhausted while using a power. We hope you enjoy the fall update and we hope to get winter updates out much quicker and more often. 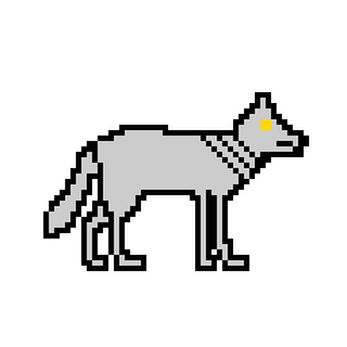 I like games where you play as an animal. Interested to see where this will be going in the future.